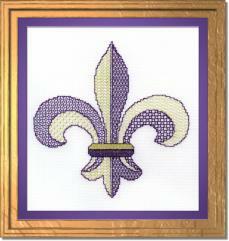 Take the traditional fleur de lis (sometimes spelled fleur-de-lys) shape and add creativity. What do you get? 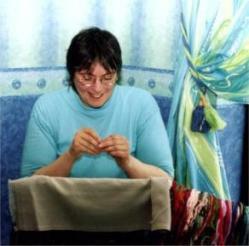 Three variations in blackwork. The direct translation from the French term would be flower of the lily, and the symbol has been used throughout history for various purposes. It is to be found in Coats of Arms, flags, city emblems and seals, throughout the world. If you travel to the French Canadian regions such as Quebec or Nova Scotia, the Southern US states of New Orleans, Missouri and Louisiana, Scotland and England you will see the design utilized. It has religious connotations also, with the three petals representing the Holy Trinity and the band around them, the Virgin Mary. Each design below features my own interpretation of this decorative element. 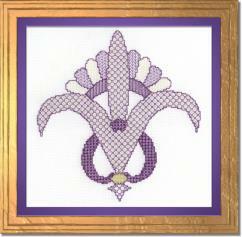 Closest to the original design, Valour is worked in purple and gold. This variation is also used by the scouting movement. Strong looking fills, reminiscent of chain mail, are used in this blackwork pattern to represent bravery and courageousness. The Iris flower, another definition of the fleur-de-lis, is beautifully depicted in this delicate floral blackwork design. The third design in the range is an ornamental interpretation of the basic shape known as the "au pied pose" where the part below the band is represented as a triangular shape. 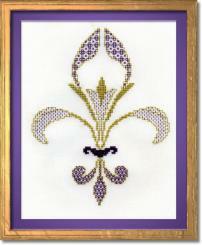 If your room has fleur de lis wallpaper, then one of these blackwork designs framed and hung, can really add a special touch.